You can fuhgeddaboudit, if you insist this phrase isn’t a real word. 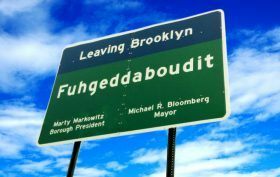 The famous saying associated with New York City and New Jersey residents has just been added to the Oxford English Dictionary. Made popular in pop culture by Italian-American characters, such as in “The Sopranos,” the word, according to Oxford, means “‘forget about it’; used to indicate that a suggested scenario is unlikely or undesirable.” Unofficial alternate spellings include foggetaboutit and fuhgeddaboutit.